The legs of arthropods are one, if not the eponymous key innovation of arthropods - the arthropodium. In taking on a sheer plethora of functions including locomotion, food handling and ingestion, but also copulation, respiration, and sensation / reception, arthropodia are one of the most versatile, most specialized and hence, likely one of the most widely modified features known. Among various taxa, these transformations have occured independently many times over, rendering arthropods and their legs in particular excellent models to study and understand pathways of adaptive evolution. 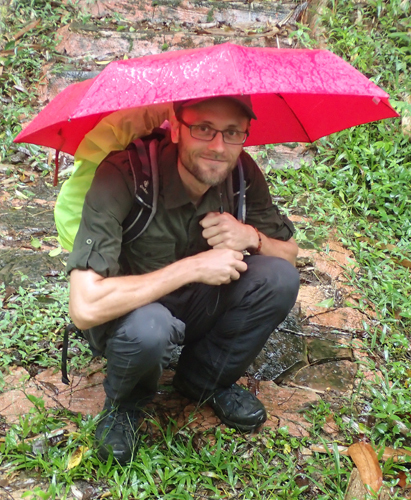 The aim of our project is to investigate the terminal legs of centipedes (Myriapoda), another significant but hitherto largely unregarded example of transformation cascades. The terminal (or ultimate) legs of chilopods are rarely used for locomotion, if at all. In contrast, in many cases the legs are transformed into a sensory appendage, resembling the antennae. Also, some species possess legs that rather might function as claws or pincers. We explore this particular chilopod character in terms of distribution, morphology, variability, behaviroal adaptations as well as sensillar and glandular organization using a multimodal microscopic and electrophysiological approach. Comparisons with antennae and "real" walking legs will help us to unravel potential constructional or functional morphological constraints in the course of evolutionary transformation from former walking legs in what is now assumed to be a sensory appendage. Kenning M, Sombke A (2017) Sensing from Both Ends? 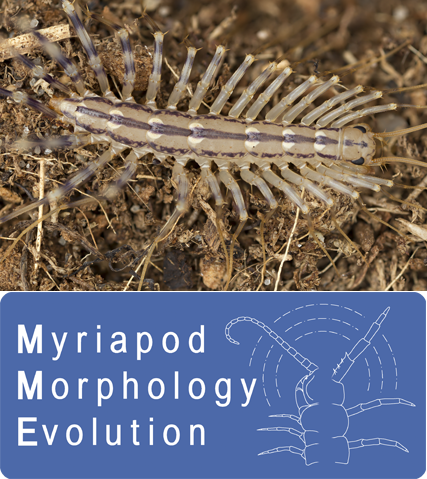 Transformation of Locomotory into Multifunctional Appendages in Chilopoda (Myriapoda). Tropical Natural History, Supplement 5: 22 (published abstract, 17th International Congress of Myriapodology). Sandeman D, Kenning M, Harzsch S (2014) Adaptive trends in malacostracan brain form and function related to behaviour. In: Derby C and Thiel M (Eds.) Crustacean Nervous System and their Control of Behaviour. The Natural History of the Crustacea. Vol. 3, Oxford University Press. Loesel R, Wolf H, Kenning M, Harzsch S, Sombke A (2013) Architectural principles and evolution of the arthropod central nervous system. In: Minelli A (Eds.) Arthropod Biology and Evolution – Molecules, Development, Morphology, Springer, Berlin Heidelberg. Schendel V, Kenning M, Sombke A (in rev.) A comparative analysis of the ventral nerve cord of Lithobius forficatus (Chilopoda: Lithobiomorpha): morphology, neuroanatomy, and individually identifiable neurons. Arthropod Systematics & Phylogeny. Kenning M (2017) Evolution des olfaktorischen Systems der Isopoda: Einblicke aus Neuroanatomie und Ethologie von Saduria entomon (Valvifera) Linnaeus, 1758. Inaugural-Dissertation Universität Greifswald. 148 p.
 Sandeman D, Kenning M, Harzsch S (2014) Adaptive trends in malacostracan brain form and function related to behavior. In: Derby C and Thiel M (Eds.) Crustacean Nervous System and their Control of Behavior. The Natural History of the Crustacea. Vol. 3. pp. 11–48. Oxford University Press.